Pleasant Valley Hospital (PVH) Emergency and Trauma Center recently earned the Level IV Trauma Center designation from the State of West Virginia. Pictured are Kelly Doczi, RN, Emergency Department Nurse Manager, Crystal Tolley, Executive Director Physician Practice Services, Gina Byus, RN, Trauma Program coordinator, Amber Findley, Chief Nursing Officer, and James Toothman, DO, Chief of Emergency Medicine. POINT PLEASANT — Pleasant Valley Hospital (PVH) Emergency and Trauma Center recently earned a Level IV Trauma Center designation from the State of West Virginia. The PVH Emergency and Trauma Center has held the designation for 13 years. The designation for the hospital is part of the West Virginia Department of Health and Human Resources Bureau for Public Health (BPH). Trauma designation is reserved for hospitals that meet the stringent criteria established by the state as part of the statewide BPH system of care that includes treatment for three of the top five causes of death in West Virginia: trauma, stroke, and heart attack. Chief of emergency medicine, James Toothman, DO, with Amber Findley, chief nursing officer, Jackie Stewart, RN, director of nursing, Genia Byus, RN, trauma program coordinator and Kelly Doczi, RN, emergency department nurse manager, spearhead the effort at Pleasant Valley Hospital. “Providing services that improve survivability is important to all of us at Pleasant Valley Hospital. Our emergency department staff works together with Mason County EMS, Healthnet and MedFlight in an organized process to ensure patients receive advanced lifesaving medicine. The hospital’s fully staffed Emergency and Trauma Center includes physicians and nurses experienced in emergency medicine and certified in advanced trauma, advanced cardiac life support, and advanced pediatric life support. The clinical medical laboratory and diagnostic imaging technologists also work around-the-clock to perform time-sensitive, diagnostic testing and treatments for critical patients. When a higher level of trauma care is required, the team transports trauma patients to one of our tertiary hospitals in Huntington,” stated Glen Washington, FACHE, CEO. “Advanced life support trauma training gives our team a higher level of efficiency when providing specialized treatments that save lives. The emergency and trauma team members are highly trained in lifesaving emergency medicine for trauma, stroke, cardiac events, and pediatric events. We are confident and secure in knowing we are providing the correct level of care at the right time,” stated Amber Findley, Chief Nursing Officer. As the area’s leading hospital, earning and maintaining Level IV Trauma Center designation for 13 years by the State of West Virginia, Pleasant Valley Hospital continues to meet the healthcare needs of those who live in Mason, Meigs, and Gallia counties as well as other surrounding counties. The Pleasant Valley Hospital Emergency and Trauma center’s processes are in place so the right patient gets the right care at the right time, helping to ensure optimal outcomes, especially when time is critical. https://www.mydailytribune.com/wp-content/uploads/sites/42/2018/07/web1_7.4-PVH-ER-Trauma-Certification-Photo_ne20187311311517.jpgPleasant Valley Hospital (PVH) Emergency and Trauma Center recently earned the Level IV Trauma Center designation from the State of West Virginia. 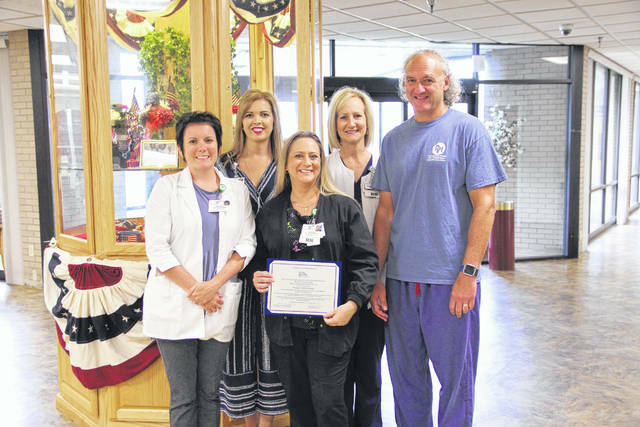 Pictured are Kelly Doczi, RN, Emergency Department Nurse Manager, Crystal Tolley, Executive Director Physician Practice Services, Gina Byus, RN, Trauma Program coordinator, Amber Findley, Chief Nursing Officer, and James Toothman, DO, Chief of Emergency Medicine.